We aim to characterize the impact of hedonic and homeostatic circuit interaction on energy and glucose metabolism in humans. By combining hedonic stimuli (i.e. 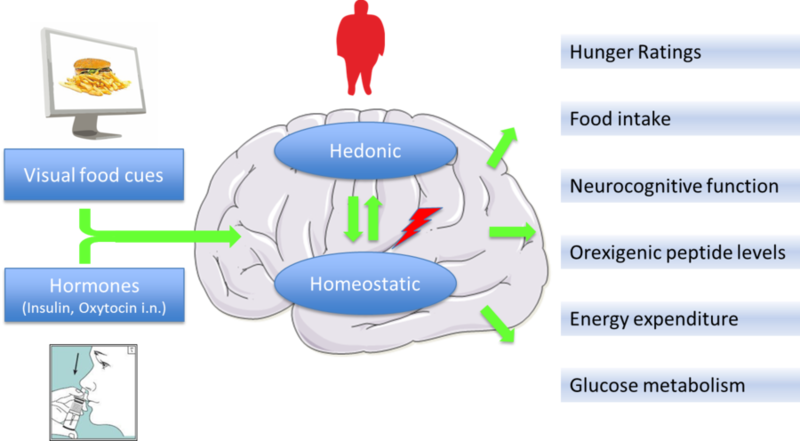 visual food cues) and central application of the hormones insulin and oxytocin, we will dissect the interaction of hedonic and homeostatic systems in the regulation of energy and glucose metabolism in normal-weight and obese participants. These results will help to generate treatment strategies for obesity caused by dysfunction in reward-processing and by the surplus of energy-dense foods. Klement J, Ott V, Rapp K, Brede S, Piccinini F, Cobelli C, Lehnert H, Hallschmid M. Oxytocin Improves β-Cell Responsivity and Glucose Tolerance in Healthy Men. Diabetes. 2017 Feb;66(2):264-271. Brede S, Sputh A, Hartmann AC, Hallschmid M, Lehnert H, Klement J. Visual food cues decrease postprandial glucose concentrations in lean and obese men without affecting food intake and related endocrine parameters. Appetite. 2017 Oct 1;117:255-262. Brede S, Fehr S, Dalla-Man C, Cobelli C, Lehnert H, Hallschmid M, Klement J. Intranasal oxytocin fails to acutely improve glucose metabolism in obese men. Diabetes Obes Metab. 2018 Sep 10. We characterize the impact of food cues and intranasal hormones on ingestive behavior and energy metabolism in lean and obese humans.